Pool Pumps - Rintoul's Leisurescapes - Above Ground, Inground Pool and Landscape ideas for Owen Sound, Port Elgin and surrounding areas. The heart of your circulation system,the pump is probably the most important single piece of equipment in the circulation system. Selecting a pool pump is determined by a long list of factors. We suggest you consult a pool professional when selecting or replacing your pool pump. The pump consists of two principal parts: A motor and the wet end. The motor provides the power to move the components located in the wet end. The wet end consists of a trap, and impeller, which is responsible for moving the water. Your pool pump pulls water from one or more suction ports (i.e., skimmer & main drain), and then pushes it through the filter & heater (if you have one) and back to the pools' return ports. Jandy is proud to introduce it's new series of pumps – three models designed for all your pool and spa needs. The new Stealth, PlusHP and MaxHP pumps are quieter, more powerful and more efficient than ever. They are designed for ease of operation and maintenance, featuring larger trap baskets, ergonomic cam-lock lids and quick-connect unions. Jandy pumps are available in full, up-rated and highly efficient two-speed models. 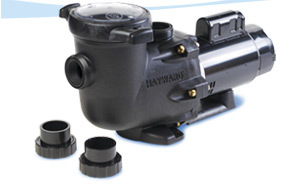 Hayward™ pumps are dependable and engineered for performance. NSF® and UL® rated, we engineer our products with components molded of corrosion-proof reinforced thermoplastic for extra durability and long life. Our pumps are equipped with heavy-duty motors for cool, quiet, efficient operation. All of our pumps are engineered and designed to stand-up to today's most demanding installations.